I work for a healthcare organization. In the lunch room today was one of those cylinders full of caramel corn and cheese corn that turn up everywhere around the holidays. This one had a note attached: Compliments of your colleagues at the American College of Chest Physicians. 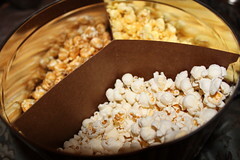 Are caramel corn and cheese corn good for cardiac health? They’ve gotta be terrible, right? Beware of chest physicians bearing gifts! CARDIOLOGIST: Who referred you to our office? PATIENT: I saw your name on a container of cheese corn. CARDIOLOGIST: Ha ha, yeah, those things pay for themselves a million times over in stents and angioplasties.